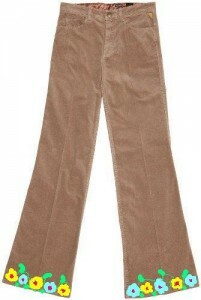 In grade 9 I had a pair of really ugly corduroy pants. They were beige and had flowers all along the bottom of the pant legs. I bought them from Garage and I thought they were really great. By grade 10 those pants were sitting in the bottom of my closet, not getting the sunlight or water those ankle flowers so deserved. I had 2 really good reasons I couldn’t wear them any more I was 4’11 and because European hemming didn’t exist in 1998, I couldn’t bring them to get hemmed at the risk of having the amazing flower pattern chopped off and I was busting them at the seams because I had gained so much weight. So the pants sat for a long while, until eventually I donated them to the Jarrett Centre. Parting ways with those pants stands out not because they were the height of fashion and I was giving them away but because they were a size 9. They are the only pants I can remember that I bought that weren’t double digits. I should have never bought them in the first place, they bunched up funny in my crotch region because I am very short and they were made for tall, thin people but size 9 is the smallest I can remember my pant size ever being, and grade 9 was some 14 years ago now. I’ve tried many times over the years to lose weight and be more active but what I’ve realized works best for me is having a place to log what I’m doing while I’m doing it. This website is for me. I want to write about my goals and setbacks, I want to write about how terrible and rewarding working out is, I want to write about how eating better and having cheat days is part of the battle and eventually I want to write about going into Garage and buying the ugliest pair of single digit pants that the store has to offer.